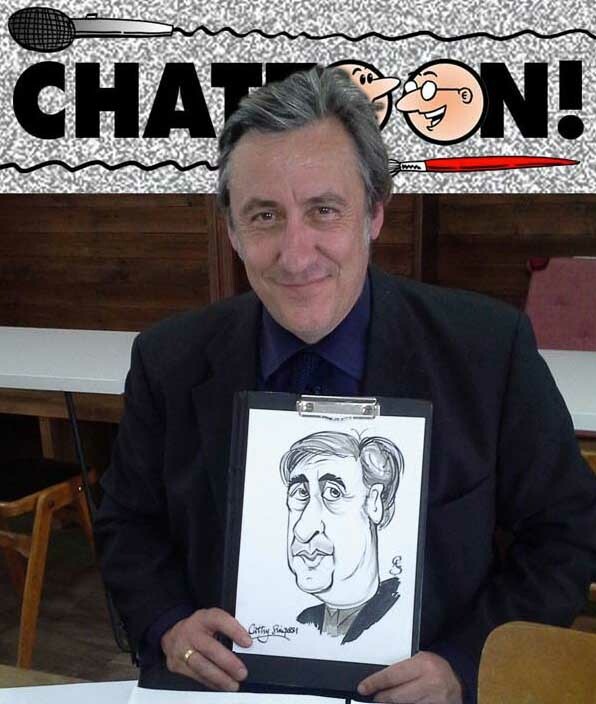 'Chattoon' is the brainchild of the luscious, pouting Simon Ellinas (sitting next to Cathy) and is a chat show where a willing celebrity is caricatured whilst being interviewed. And here's Andrew Graham-Dixon, in discussion about Chattoon being released for television purposes! Cathy Simpson is a very experienced cartoonist and caricaturist, available for bookings in the Nottingham-ish and East Midlands area. Her presence is guaranteed to break the ice at any kind of event - party, wedding, exhibitions, promotions or corporate hospitality. She also has oodles of experience of working with children in schools and community arts workshops, and very quickly builds up a rapport with them. Children love cartoons and caricatures! If your event has a theme, she'll cheerfully join in! "Cathy worked her magic at our wedding reception last month. She did a fantastic job, our guests were talking about the caricatures weeks after the wedding. Was a brilliant added extra to our day." All images on here belong to Cathy Simpson. If you want to borrow one, just ask first. Simple theme. Powered by Blogger.